Since then, I've worked on many truly exciting projects for Microsoft, including some visits to the vast Halo universe, the nightmare world of Alan Wake, the darkly funny Gears of War series, the beautiful natural landscapes of Fable, the alien creatures of Iron Brigade, and many others. I'm both a field recordist and a sound designer. I document the world at large using microphones... that's the "field recording" part. I also create sounds in the studio for fictional characters and environments... that's the "sound design" part (though the two often overlap). I've been spending an increasing amount of time in recent years traveling to new places (and listening to them! ), field recording, performing live with The Seattle Phonographer's Union, and cultivating a lot of new sounds. I'm planning to make some of the sounds I've collected available as sound effects libraries for eventual hire. There will be more information about these libraries on this page as I move forward. 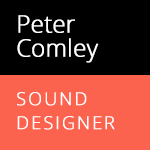 I'm currently available for sound design work and consultation.